Bonding with others will make you healthier and more successful. Ever since first cohabitating on the plains of Africa, we Homo sapiens have understood the benefits of living in communities. Back then, early humans would come together to hunt and cook; they knew that, as a group, they stood a much better chance of surviving than they would if each individual had to fend for him- or herself. This profound desire to connect and bond with others is still with us. Whether it’s at cocktail parties, town-hall meetings or Star Trek conventions, we simply love the chance to meet and be around others. It’s a universal human trait. And, in addition to being written into our very nature, bonding with people is actually incredibly beneficial to our health and well-being. Those of us who are good at connecting with others stand a better chance of living a long life. One study by Dr. Lisa Berkman of the Harvard School of Health Sciences observed a group of 7,000 people over nine years. Her results showed that those who lacked quality social or community connections were three times more likely to die of a medical illness than those who had strong social ties. But a longer lifespan isn’t the only benefit of continuously making new friends. It’s also essential for success. Whatever we dream of in life, whether it’s a great job, a new partner or a ticket for that sold-out Broadway show, you’ll stand a much better chance of finding it if you have a wide social network to help you. You’ll hear about job openings from former colleagues; friends will set you up on blind dates; and, who knows, an acquaintance may well be selling exactly the ticket you’re looking to buy. Okay, so the benefits of bonding are clear. But that doesn’t mean connecting with others is easy. In fact, it can be pretty hard to connect with new people, especially if you don’t have any shared interests. What’s more, whenever you meet someone, you only have around 90 seconds to make an impression. If you don’t spark the person’s interest in that time, it’s highly probable that you’ll never spark it. 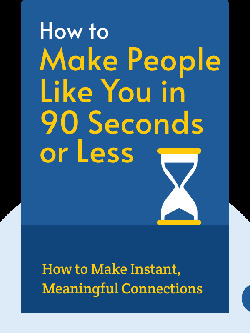 Luckily, it’s possible to kindle connection in under 90 seconds. In the following blinks, you’ll learn the essential skills and hacks that will enable you to do this. When you first meet someone, pay attention to your body language, eyes and facial expression. In order to establish a good rapport with others, you must develop the right attitude. To be likable and credible to others, display open and consistent body language. Mirroring mannerisms is natural and can help you make people feel relaxed in your presence. The key to good conversation is asking the right questions and knowing how to listen. Understand what sense your conversation partner prefers and adapt your style accordingly. Start your free Blinkist trial to get unlimited access to key ideas from How to Make People Like You in 90 Seconds or Less and over 3,000 other nonfiction titles. With bitesize text and audio, it's easier than ever to find the right ideas to transform your life.